Write on carbon paper – the child has to write softly so the marks barely go through the paper. Color using shading to demonstrate that different shades require a different amount of pressure. Try this free Shade Wisely activity or Missing Monster freebie. Provide extra input to the hands before the students write. Warm up by squeezing a stress ball or upper extremity weight bearing activities such as wheelbarrow walking, Proprioceptive Poems, animal walks or wall push ups. Fine tune the fingers and grip with clothespin activities. Try the free Ninja Clothes Pin activity. Play some visual perceptual clothes pin games. Make clothes pin silly faces. Wrap clay around pencil – if student changes the shape of the clay the student is applying too much pressure. 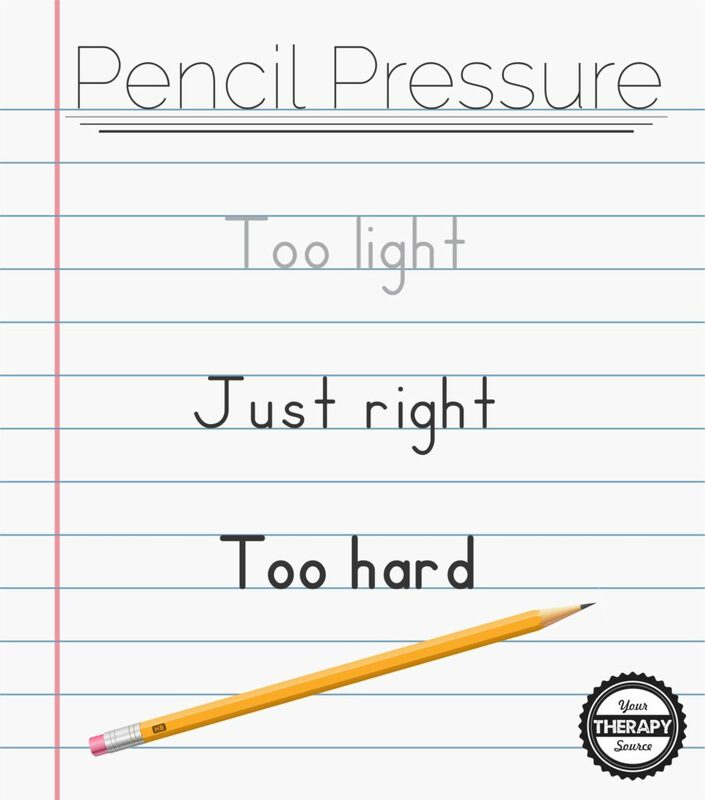 Use a mechanical pencil – if student applies too much pressure the tip will break off. Use a slant board – when the students wrist is positioned in extension it can improve pencil control. Place student’s paper on top of a flimsy book or Styrofoam – if student presses too hard the pencil will poke through paper. Provide sample of handwritten work with correct pencil pressure. Write one word too light, one word just right and one word too hard to represent the differences in pencil pressure. Explain to students exerting too much pressure when writing can fatigue the hand. Have students practice writing lightly, writing just right and pressing too hard. Can they feel the differences in their hand? 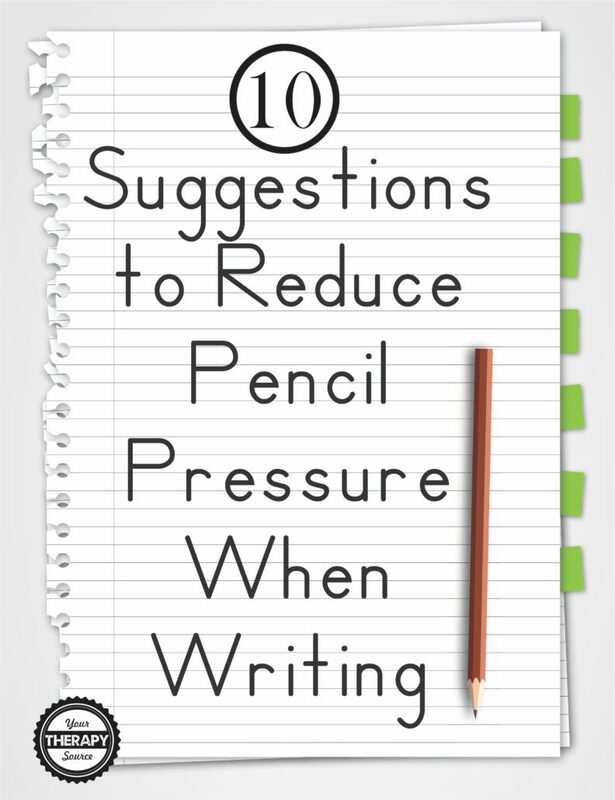 Click here to read 10 ideas to increase pencil pressure. 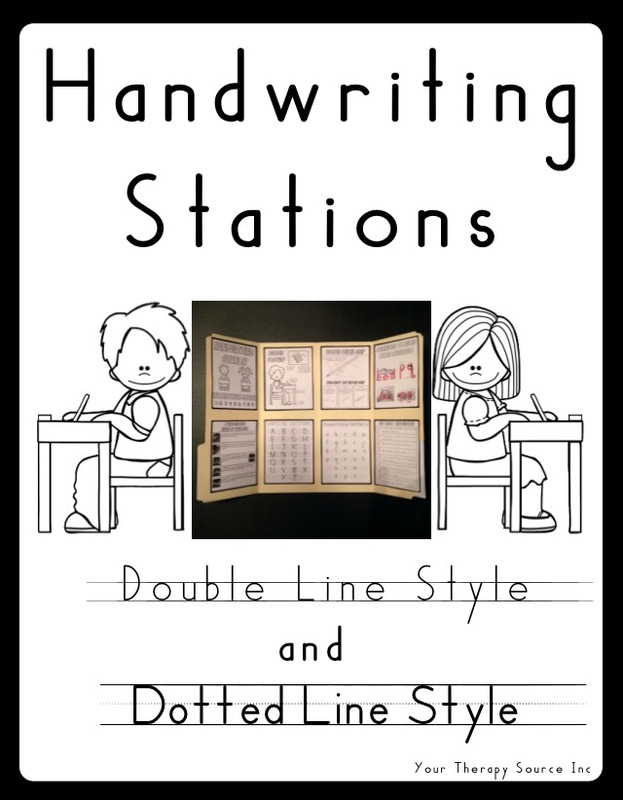 Handwriting Stations: This digital download includes the materials to create a handwriting station on a tri-fold or in a folder. The station includes proper letter formation for capital and lower case letters, correct posture, pencil grip, warm up exercises, letter reversals tips and self check sheet. In addition, there are 27 worksheets for the alphabet and number practice (Handwriting without Tears® style and Zaner-Bloser® style). This download is great for classroom use, therapy sessions or to send home with a student FIND OUT MORE INFORMATION.